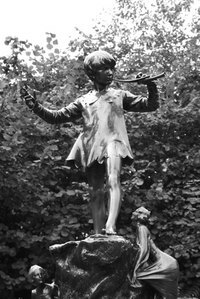 Peter Pan's green feather cap is emblematic of childhood and all the delights (and uncertainties) that accompany it. The hat's construction features a pointed top and a folded brim. This simple constructions means you don't need to be an expert hat maker or seasoned costume designer to create your own Peter Pan hat. The hat is so easy to make, you can construct one from felt in under an hour. Wrap a measuring tape loosely around the wearer's head, positioning the tape at about mid-forehead to determine the wearer's head circumference. Record this measurement. Cut a triangle from felt that has one side with a length equal to the wearer's head circumference and two sides with lengths equal to the head circumference plus a 1/2 inch. Use a ruler and a rotary cutting tool to make accurate measurements and cuts. Fold the felt triangle in half, matching up the edges of the longer sides. Insert straight pins every inch along the matched-up edges. Thread a sewing needle and sew the long edges of the triangle together using a back stitch (sew from the back of the felt layers to the front, sew back into the felt 1/8 inch behind the point from which the thread emerged, sew from the back of the felt to the front 1/8 in front of the previous stitch and repeat). Begin sewing 1 1/2 inches above the bottom of the triangle and leave a 1/2-inch seam allowance as you sew. Tie off the thread to secure your stitching when you've sewn to the triangle's point. Open the seam allowance and press it flat with an iron. Turn the cap right-side out and turn up the brim (the bottom 1 1/2 inches of the hat). Sew a tiny "x" through the brim and hat fabric on either side of the cap. Make the stitch 1/4 inch away from the top and front side edges of the brim. Attach a feather to the left side of the hat, orienting it to point upward toward the back of the head at a 45-degree angle. Hold the feather in place with a few stitches, sewing through the back of the fabric, wrapping tightly around the feather's base, and sewing back into the fabric in two or three places.